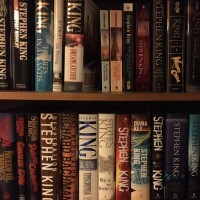 Writings in English on the works of Stephen King. A terrible crime has been committed in Flint City. Ralph Anderson, one of the town’s three police officers, has a prime suspect and decides to make the arrest a public affair. The popular Coach Maitland, uncomprehending, is brought away in cuffs in the middle of a game, in front of a big crowd and his family. He is just as stunned as Anderson is sure of his guilt. It’s a perfect, vivid example of building conflicting loyalties in the reader. What is one to believe? As events unfold, interspersed with witness protocols that certainly points to Maitland being the head suspect, this sense of ambiguity only deepens. Along with his family he seems a victim of a terrible mistake, but if guilty of the vile crime he is in fact a monster. What is one to believe…? It’s one of those books that grab you from the get go and pulls you in, skipping between the various victims of the obscene crime, including the family of the murdered boy, whose suffering has only begun. Those parts offer some of the book’s best prose, wise, unexpected and moving perspectives on tragedy and grief. But the suspect and his family also draw sympathy in their plight. Here, everyone is a victim. The tragedies of The Outsider are manifold. The crimes destroy surviving family members and people’s good name. It’s the final insult added to the injury, how seemingly innocent suspects become the object of hatred and anger. The sudden introduction of elements that seem otherworldly do little to lessen interest but may prompt the reader to wonder what kind of book they are reading. The answer will become clearer with each chapter. Genre aside, it’s most definitely a solid page-turner. It hooks you. It’s also damn spooky. The phrase ’straws for eyes’ alone is enough to give one shivers. But like any detective story worth reading, it’s also an excuse to send people around, meeting other people, asking questions from witnesses and incidentally painting little portraits of life outside of the limelight. And King is, of course, very good at that. In its attention to detail, The Outsider can occasionally also get … tedious. There are times when points are belaboured. Like the last Hodges book, it’s also a bold mix of the pragmatic and the supernatural, and may not be to everyone’s taste. For my own part, I’m frankly not exactly sure how I feel about it. But meeting Holly Gibney (from the aforementioned Bill Hodges books) again is great, and King once more excels at portraying a character inherently nervous and uneasy about human interaction, but very brave. Around her, a band of unlikely friends will form, bringing Bram Stoker’s Dracula to mind in more ways than one. At the end of it all, The Outsider is more akin to Doctor Sleep than Mr Mercedes. It’s a both moving and harrowing story with a thrilling climax. Whether or not you entirely “buy it” may be a matter of taste. The melancholia instantly leaps off the page in this tale of youth, broken hearts and a rickety amusement park in North Carolina called Joyland. King’s knack for transporting you to a place and time, and a mood, is on full display. Written in the first person perspective, it recounts a summer and fall in 1973 during which Devin Jones, “a 21-year-old virgin with literary aspirations”, works as a carny while trying to get over a girl. The writing is sympathetic and atmospheric, clear and uncomplicated; ‘this is what happened and how I felt about it’. The start, where Devin visits the park for a job interview, is like an inverted version of The Shining. Nice people, spring around corner. Spring turns to summer, work begins, and to a large degree this is a story about a good summer. One of those summers that shine in retrospect. New friends, a fascinating place. Even ‘wearing the fur’, dressing up as the park’s canine mascot to amuse the kids, suits Devin. Ominous comments from the fortune teller and a broken heart notwithstanding, this has all the makings of a great experience. But there’s also the actually haunted horror house and the horrific tragedy that occurred there. And Devin’s inability to forget the girl and move on. He thinks staying on at the amusement park after summer will help with that. A seaside amusement park in the fall. How very Morrissey. Devin wants be changed by facing something otherworldly and courts an encounter with the apparition said to be haunting Joyland. In Devin’s befriending a young boy with a serious illness and apparent telepathy, the writer introduces another subject typical to King, but it’s toned down and actually not what you’re likely to remember best about the book. That would probably be the colourful portrait of the amusement park and its characters and the depiction of youth itself. This is prime King. Wise, empathetic, crude, poetic, lively and eerie. Near the end it delivers themes more in keeping with the Hard Case Crime label (an imprint under which The Colorado Kid was also published), but at this point it’s clear that King was never interested in writing just a murder mystery. Big surprise. It is ‘thrilling’ in surprising ways alongside the expected ones. Will a good deed work out for the best? That kind of way. The finale, with its echoes of a scene from a famous movie not named here, and the touching epilogue confirms that this book really, really needs to be filmed. Done right, it would be wonderful. As is the book. I would in fact describe it as the perfect antidote after reading Revival (published in the same year). There are some common themes (looking back from the sad vantage point of old age being among them), and Joyland has its share of violence and chills, but it also offers hope and beauty. Call me crazy, but I prefer that. It took me an inexplicably long time to finish this collection of short stories, but looking back I realise that most of them left an impression. Like The Gingerbread Girl, a short, effective thriller about grief and a serial killer. Or Harvey’s Dream, both mundane and shiver-inducing. Graduation afternoon is a short, brilliant gem about how everything can change in an instant. The Things They Left Behind is a strange but pretty moving take on 9/11. There are a couple of low-key guesses on what the afterlife might have in store (muted but optimistic compared to Revival) and a confessional tale about telling the wrong story to a hitchhiker. N., related to but not as devastating as the aforementioned Revival, combines Lovecraft and Machen with a fantastic (and possibly dangerously contagious) evocation of OCD. Atmospheric to say the least. The Cat from Hell is apparently a golden oldie, finally collected. A trifle, but captivating while it lasts. Ayana recounts a tale long untold, because it is ’unbelievable’, and its opening description alone of seeing a once vital father diminished by illness makes it memorable. It’s about miracles or, as doctors call them, ‘misdiagnosis’. It’s a short story in length as well as in how it foregoes explanation in favour of mystifying ‘anecdote’. Through all if it, King’s ear for dialogue and eye for detail brings the characters and settings to life. Bitter people, happy people, highways and highrises. Even if King didn’t have any stories to tell here, the writing would make it worthwhile. But he does. With the possible exception of Stationary bike. In true King fashion, the collection ends with some enlightening, personal notes on the origin and meaning of the stories. His generosity in inviting the readers into the creative process has always been part of his appeal. A story about losing faith and looking for other things in its place. But one dedicated to a veritable Who’s Who list of classic horror writers and featuring references to De Vermis Mysteriis. How very King. And like the cautionary tales of old, it’s a tale wherein the narrator wants to tell his whole story, not just the juicy bits. The new minister in the Methodist church seems like a nice guy to six-year-old Jamie, youngest in a big family, growing up in the shadow of the Cold War in the 60s. Written from the first person perspective and initially set in the small town of Harlow, Maine, not far from Castle Rock, the story in general seems nice enough at first, encapsulating childhood with King’s usual deftness. Apart from a deeply ominous prologue, that is. Early on, though, Jamie underscores that this book isn’t about happy childhood memories. And it isn’t. It’s not even primarily about childhood. In fact, it’s just as much about aging. And its inevitable consequence. Reverend Jacobs is interested in electricity. He employs it as a teaching aide during youth nights, to the point where parents and children alike find it a bit overmuch. He also finds other uses for it. For example a small miracle, which brings joy. Then utter tragedy strikes the minister’s family, described in King’s typical unflinching manner. The “terrible sermon” that follows makes Jacobs’s continued service an impossibility. To young Jamie, though, it’s as if the truth has finally been told. Later, Jamie discovers music. The electric guitar, of course. King delights as much in describing the joy of this discovery, as well as the young love affair to follow, as he excels at describing horror. When presenting Jamie as a junkie, I should add, we also get to enjoy King the dark comedian, relishing this chance to bring life at rock bottom to, well, life. Not unlike some scenes in Dr Sleep. One wonders if King is campaigning to warn Constant reader of the dangers of drugs or if he simply writes what he knows. The two meet up later in life, when things are very different for both of them. Electricity is still very much a thing for the former reverend. Much more so, in fact. But the things he can do, ranging from cheap tricks to mysterious healing, seem to have after effects. Somehow the spookiest line I’ve read in ages. Later still, Jacobs is a travelling preacher and healer. Even if the rev’s new-old career might be a ruse, the description of a revival tent meeting has elements of genuine warmth. And crass deceit, as well. And, still, the electricity. Like 1922, it’s a story you’d be forgiven for abandoning before the end. But whereas 1922 begins almost at rock bottom, “Revival” presents the good times first, or rather interspersed between the bad ones. That makes it even worse. Like the two preceding books in the Hodges trilogy, End of Watch begins on that fateful night in 2009 when “Mr Mercedes”, a young sociopath named Brady Hartsfield, kills a number of people using a stolen car. This time we join the proceedings in the company of two paramedics responding to the MCI call. They save the life of a seriously wounded woman named Martine Stover. But as the new story skips to current day, Martine is dead. Like many others linked to Hartsfield. It’s almost as if he is still pushing people over the edge, even though he is in a clinic in a practically vegetative state. Closure is the key term as detective Hodges and his partner Holly are forced to once more confront a murderous young man who, judging by all evidence, is incapable of doing anything at all. Following the continued evolution of the once isolated Holly is a treat. She is never smoothly confident, but has become sufficiently sure of herself to take control when needed. Evolving, if that’s the word, is also the murderous Brady Hartsfield, slowly coming out of a comatose state in a way reminiscent of King’s more supernaturally charged work. For Hodges, things seem to be turning bad health wise, just as he realises he still has some loose ends to tie up. His penchant for keeping secrets is a somewhat frustrating aspect of this book as well as the previous ones, but luckily, he can’t fool his friends for long. Of the three Hodges books, this is the one most in line with what casual users might expect from King. With the focus on an outdated game console being used as part of an ambitious scheme it’s as much a techno thriller as a supernatural one. The combination of telekinesis, technology and the detective novel works surprisingly well, though. It’s a bold mix, but it’s presented in a matter of fact way that makes the concept strangely credible. When the story picks up speed in a series of events and crises, it never actually slows down, but more focus than I would have preferred is placed on the details and minutae of Brady’s last scheme. Other themes include even less cheerful ones like suicide and cancer. But at heart, like so many of King’s stories, it’s also a tale of friendship. The finale, in keeping with the other two books, is tense and exciting and the epilogue is touching. Summing up the series: once more exploring a new-ish format, King has again proven that he can write in any genre and style, and pull the reader in. In a neat reference to Cujo, we learn that boy band ‘Round here were sometimes sponsored by Sharp Cereals. After a prologue set in the 1970s, Finders Keepers begins on the very same night as Mr Mercedes, with an out-of-work man queueing for a 2009 job fair which we know won’t happen. Because of ’Mr Mercedes’. The storyline set in the past, where an elderly writer is assaulted in his home, has no immediately obvious bearing on this tragedy. In Morris Bellamy, the young literature fan who helms the crime, the book finds an equivalent to Brady in Mr Mercedes, though. Almost void of empathy and capable of horrific acts but with elements of humanity and a detached sense of dark humour. A creature not unlike Pinkie in Brighton Rock. The threads converge when the boy in a problem-stricken family finds a strange treasure buried three decades ago. The problems are, of course, born of the 2009 vehicle attack. The seeming solution is a treasure buried after the assault on the writer. The boy, Pete, decides to use it to play the part of secret helper, bringing his family much needed relief. But the treasure is not confined to cash. There are notebooks as well. And for the ageing Morris, whose prison term (for an unrelated crime) is finally coming to an end, these are way more important. King has tried many styles of writing and I like them all. That said, the sparse but vivid prose he employs in the ‘Hodges books’ is particularly great. He is always good with atmosphere and setting, but in these books he seems to take special delight in description, mixing the laconic tone of a hardboiled detective novel with vivid, often funny imagery. It’s also a book about reading and writing, topics famously dear to mr King, and through (among other things) a quirky literature teacher he seizes every opportunity to impart exhilarating wisdom on the subject. Two main characters, with wildly different temperaments but equally invested in the same writer, with occasionally parallel story arcs and even inhabiting the same house in different eras, represent two sides of the consummate Reader. Fittingly, it’s a book that effortlessly keeps your interest, with comical details and small surprises tucked into the bigger narrative. With new and often sympathetic characters alongside familiar ones, all of them elegantly connected and with their part to play. As for the returning characters, Bill Hodges may not be King’s most charismatic character to date, but it’s nice to see the evolution of Holly, the former ‘hikikomori’, whose quirks are fondly and funnily captured without a hint of mockery. Jerome is a good character but his antics as ‘Tyrone Feelgood’ exemplify an area where I feel King rarely excels: adding comedy through characters trying to be funny. Like Eddie in The Dark Tower, he’s best when he’s not joking around. Even though the book spans less than 400 pages, King also manages to squeeze in a brutal, almost darkly comical version of The Shawshank Redemption. Three quarters in, a quite extraordinary element is added to the mix. Something involving Brady Hartsfield. Something very King, yet, one thought, not to be expected in this book. But that’s just a brief interlude (or teaser of things to come) in a tale of obsession, good intentions gone bad and strange coincidences. With a finale almost as tense and twice as violent as that of Mr Mercedes. And one heck of a spooky epilogue. The opening scene is great; vivid and deeply humane, where two lonesome, jobless people in recession America meet while waiting in line for a job expo. It’s depressing and heartfelt, almost political in a good way. Then disaster strikes. A man-made disaster, created on purpose with the aid of a stolen Mercedes. The ‘perk’, surprisingly, is introduced as a character in his own right in the following chapter, rather than kept in the shadows. Over the course of a job conversation with a colleague we learn more about him than the letter revealed. Including the fact that he hates everyone but knows how to adapt. Initial reaction: the focus on the woman who owned the car used for the murder slows down the proceedings. It later turns out that this focus is warranted, of course. Not least since her sister will become a major character. A romance thriller, what was the odds of King writing one of those? Well, it’s more than that of course. The portrait of the killer is every bit as twisted as the love affair is cute, revealing a young man with no doubt serious issues but few redeeming qualities. And yet surprisingly human in some of his reactions. It’s also sprinkled with technical info and computer tidbits that feel surprisingly up to date. King seems to have done some serious homework on this one. A particularly shocking sequence around half-time extinguishes any “fears” that King is writing a normal thriller. A flat, laconic summary of a defining event in Brady’s life continues this trend. It’s a tough read, especially since Brady’s perspective includes a crass, sickening sort of jocularity. The dark turn veers into a nose dive as things go from bad to worse. When a peek into Brady’s world view around three quarters in view sums up nihilism as well as anything you’ve ever read (history is aptly described as ‘scar tissue’), the romance detective novel association is just a vague memory, although the introduction of a psychologically challenged woman and her swift friendship with Hodges’s friend Jerome brighten up the proceedings somewhat. The stakes are as high as in a “normal” thriller, though, and a race against time provides suspense to the very end. And by suspense I mean Suspense. This one nearly gave me a heart attack. The window through the keyhole is the perfect gift to fans of King’s Dark tower epic, leaving his audacious and frustrating ending intact as the closing point of a tale more than 30 years in the making. Instead, his latest addition is a story within a story within a story, the middle one set in Roland’s youth (soon after Wizard and Glass) and the last one starting right after the ka-tet has left the city of Lud. The innermost one is a grim and beautiful fairytale placed in Mid-world. They are, all of them, wonderful. At some 300 pages, this is King at his most condensed, adopting a style unknown to many casual readers. Taking shelter from a deadly cold storm known as a starkblast, the ka-tet spend the time listening to Roland as he tells the other two stories. The one wherein he is the main character deals with a murderous shape-shifter out in the countryside, whom Roland and fellow gunslinger Jaimee are sent to hunt down. In passing, almost, we get some more clues about the world that was and the events that were to change it. We hear different attitudes towards the rulers in Gilead and towards Farson, the ‘good man’ who is to lead a rebellion against them. At its third level, the tale is arguably the most fairy-taleish, with creatures such as the ‘sighe’ which would feel slightly out of place in Roland’s time, some old-fashioned magic and even a dragon. It is, fittingly, a story told by a young Roland to a frightened child to pass the time and ease the horror of a recent tragedy. This titular tale takes up more than half of the book and once you’ve decided that the resolution to the other two can wait a bit, it’s sure to grab your attention. Here as well, a starkblast becomes an important element. King also takes the opportunity to provide some consoling details to the saddest part of the gunslinger’s long, strange life. If Sai King should decide to write more such complementary tales about Mid-world, it would be awesome. If not, this little book is still a treasure to be grateful for. One day an invisible barrier appears around the small town of Chester’s Mill. It’s not a “dome” precisely, to be nitpicky about it, but the effect is roughly that of a huge glass bowl – or rather, town-shaped tube – descended from out of nowhere. Those caught on the inside may soon be the talk of the world, but they are also completely isolated from it. With dizzying speed, things spin out of control as the second selectman and de facto ruler of the town eagerly grasps for this chance of total control. Some people oppose him. It’s tempting – irresistably so, almost – to read Under the Dome as an allegory of our times, right down to specific environmental issues and how certain characters seem to echo the traits of certain politicans of (probably lasting) ill repute. Even more importantly, however, I think it is about random, wanton cruelty. It’s deeply pessimistic, a downward spiral that at times seems intent on burrowing straight down into utter despair. It’s also entertaining, if that is the word, in its multitude of memorable characters, hectic pace and abundance of dramatic situations. Whether it’s a masterpiece, I have yet to decide for myself, but it’s King at his peak – demanding your attention and alternately punishing and rewarding you for getting on this journey.